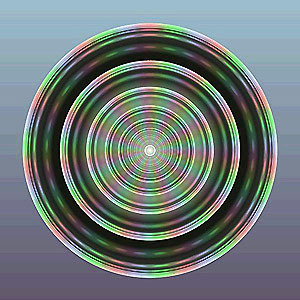 "Mutharaiyar, Concentric Circles with 33 rays." Created by our brother Charles R. Henry. by T.L. Subash Chandira Bose, Gary A. David, and Jack Andrews. We would like to convey our sincere thanks to all our friends for their interest shown towards all our articles, especially those on symbols, and also for the encouragement shown to take up the research and study of concentric circles. We are trying to unfold the mystery with the maximum possible evidence. Introduction: Concentric circles, one above the other with a common center, have been found all over the world. These symbolic circles are also found with vertical and horizontal lines intersecting the center of the circles. 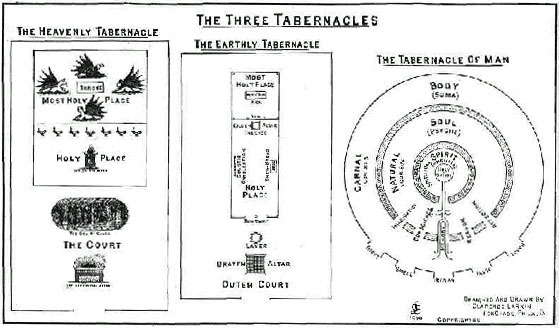 Observations: Three concentric circles occur in some holy temples. At Stonehenge the stones were laid in one, three, five and seven circles. However, the most commonly found contains only one circle of stones. 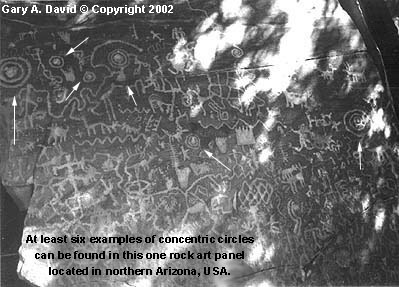 Concentric circles are also frequently found on rock surfaces (rock art). The Common Questions: What is the common phenomenon between the concentric circles found at Stonehenge and those in other sacred temples? Why was the number of circuits selected to be 1, 3, 5 and 7? What is the maximum number of concentric circles? Where did the knowledge come from? Is it an ancient geometry; if so what exactly is that? Are these concentric circles related to spirituality? What information did our ancestors leave for us to understand? Study: The circles are part of geometry; to draw a circle there must be a radius or diameter with linear measurement. The circles can be drawn with any arbitrary dimensions, but they will not form uniform circles one above the other. There must be a specific method in the selection of the dimension of the radius or the diameter in order to form the uniform circles one above the other. What is the specific method to select the dimensions of the radius or the diameter? Let us refer the ancient system of linear measurement. Ancient system of measurement: In India there are many ancient manuscripts related ancient geometry dating back to 3000-2000 B.C. Among those manuscripts we are referring to the system of measurement, Mayamata, Chapter 6, translated by Bruno Dagens. 5.1 All habitations are defined by their dimensions. I am going to present as well, methodically though in few words, the system of measurements. 5.2 The Manangula is known to be a multiple of an atom, defined as that which can be perceived by the vision of those who have mastered their senses. 5.3-6a Eight atoms are equal to a speck of dust; in multiplying each eight times eight, we go from a speck of dust to the tip of a hair, then to a nit, to a louse and finally to a grain of barley. Eight barley grains make a digit (angula), which is called matra. Twelve digits makes a span (vitrasi), twice which is a cubit (hasta), called by the learned as well kisku; twenty-five digits make a prajapatya, twenty-six a dhanurmusti and twenty-seven a dhanurgraha.
. etc. ; but houses are to be in cubits. The sage should employ the span for vehicles and seats, the digit for small (objects) and the barley grain for very small ones. Such is the system of measurements. etc. ; that which has just been mentioned is also called  digit taken from the body (dehalabdhangula). 5.13a Knowing all this the architect must measure rigorously. 5.3-6a Eight atoms are equal to a speck of dust, in multiplying each eight times eight, we go from a speck of dust to the tip of a hair, then to a nit, to a louse and finally to a grain of barley. Eight barley grains make a digit (angula), which is called matra. We have tabulated the above for convenience and comparison purposes. 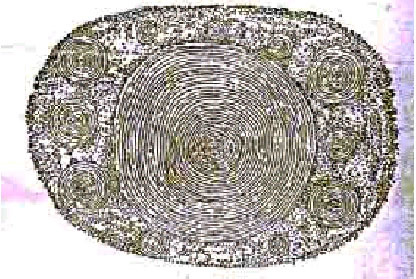 One angula is equal to 8 x 8 x 8 x 8 x 8 x 8 (atom, speck of dust, tip of hair, nit, louse and grain of barley) or 262,144 atoms (one atom - 0.000003814 angula in length). Dear researchers and scholars, kindly note that the number eight plays a big role in the ancient system of measurements. With the lowest 0.000003814 angula (the size of atom) as a measurement of a side, a square is drawn. The area of the sides is added and the square root of the product is the hypotenuse. Then the size of hypotenuse is taken as the measurement for the sides in the next square. By continuing 66 times, we shall arrive at the square with the side of one angula. With the same principle, 1 angula to 262,144 angula can be arrived at in 36 times. We shall find every alternative number with the size (side of the square) of 1,2,4, 8,16,32, 64, 128, 256, 512, 1024 …………and 262,144. Leaving the first dimension one (1) we shall observe from 1 to 32 (ten times 10), 32 to 512 (eight times 8) and 512 to 262144 (eighteen times 18). In total, 36 times. (36 times!) 36 squares; and if the squares are changed to circles, there would be 36 circles one above the other. Let us unfold the secret and sacred code by referring to the Holy Bible, the Old Testament Book of Ezekiel-- the vision of the temple. The size of the womb chamber of the most Holy of Holies is 20 long cubits long and 20 long cubits wide. The wall thickness of the womb chamber is six long cubits, so the total area 32 x 32 = 1024 square long cubits. We must note the final and largest diagram (in Mayamata, Chapter 7 diagrams) is the square divided into 1024 equal squares, which is Indrakanta. The secret of the ten stages (Ten) from 1 to 32 indirectly is shown in the size of Holy of Holies. Let us further double its area: 1024, 2048, 4096, 8192, 16384, 32768, 65536, 131072 and 262144 square long cubits. In the eighth stage (Eight) of doubling the area we find 262144, which is the area of a square having sides of 512 long cubits long and 512 long cubits wide (512 x 512 = 262144). The size of the outer court of Ezekiels temple is 500 long cubits long and 500 long cubits wide, having a wall thickness of 6 long cubits. This means that the size of the outer court including the wall thickness shall be 512 long cubits long and 512 long cubits wide. Is it a coincidence or reality? We shall discuss this in the concluding section. Are we on the right path in our study and research of concentric circles? Is there any evidence in the form of symbols or ancient pictures with 36 circles found in our Mother Earth? It is natural to human beings to ask for such evidences? It appears our ancestors were also aware of this and left the evidence in Central Australia for our ready reference. A ceremonial wooden plaque found in central Australia, now kept in the National Museum of Victoria. Thanks to Erich Von Däniken, Pathway to Heaven. "Yes, it is there, and that is the Master Key found in Tamil Nadu, India." An ancient geometrical diagram (master key) was found by author T.L.Subash Chandira Bose on the floor of a cave temple in Tamil Nadu, India. According to Srirangam Sridaran, Registration Officer, Department of Archeology, Government of Tamil Nadu, the construction of this cave temple is of Mutharaiyar style temple architecture and it was built during (600-700 A.D.) the period of Pallava Kings. The vertical lines at the extreme right side are the sides of a square. Inside this the damura (one of the symbols in Lord Sivas hands) is marked in the middle and triangles with circles are marked at the ends. The diagonal of the square is the 45 degree line with two arrow marks. The side of the square (horizontal) is further extended with two arrow marks followed by a vertical line up the center of the diagram (Key). The total horizontal length of the line measures nearly 39.5 inches. (N.B. The diagram (Key) at the left side is slightly oblong in shape). The Key symbols found in Tamil Nadu, India. 39.59797975 inches, which is very close to 39.5 inches as measured by the author. 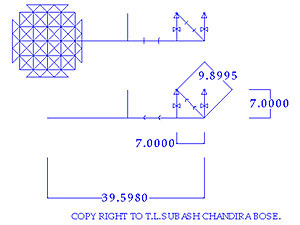 Is there any such symbol or geometrical diagram found anywhere in the world? Please advise. "The Vedic Samhitas are followed by Brahmanas and the Aranyakas. As we have said elsewhere that if we accept 3000 B.C. as a convenient date for the Rig Vedic culture, the Aitareya Brahmana will have to be assigned a date 2500-2000 B.C. ; the Satapatha Brahmana 1500 B.C., the Taittiriya samhita 1600 B.C., and this period is then followed by the period of the Srautra Sutras." "Increase the measures by its third part and this third by its own fourth less the thirty- fourth; (the name of this increased measure) is savisesa." "It should be emphasized that the geometry did not develop in this country (India) on the lines of Euclid; Bodhayana discovered his theorem independently prior to Pythagoras in context of the fire altars. The Yajnasatas were the open-air observatories and laboratories of our ancients and in their contexts they developed geometry, mensuration, astronomy, and structural geometry including bricks of different sizes. In context the Satapatha Brahmana and Taitiriya Samhita discovered rational rectangles and the property of circles." Geometry in Ancient India, Shree Satya Prakash Sarasvati, page 12. We shall observe in the above diagrams the formation three concentric circles in the ancient ritual ceremony of marking the cardinal and ordinal directions. 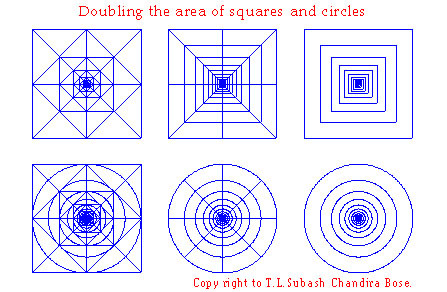 As discussed earlier the area of square and circle is doubled up to 36 times in the diagrams below. Dear sisters and brothers, please make your suggestions or comments regarding the major role of nine circles in the above three diagrams. If you’ve seen any figure of nine concentric circles, please let us know about it. 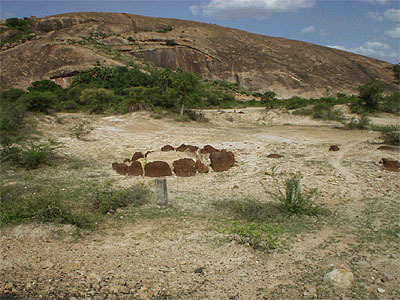 Concentric circles at Lord Siva temple and a mini-Stonehenge found in Tamil Nadu, India (Author’s collections). 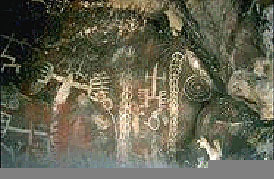 Rock art panel located in northern Arizona, USA. - Thanks to the authors concerned. Conclusion: According to south Indian culture, a person soon after his death will attain the Paralokha (Heaven). It is "the" sacred meaning of Stonehenge with its single stone circles. With a point at the center followed by three circles, the center point is The Principle Unity (the center of the most holy place), the circuit next to the center is heaven, next to the heaven circuit is physical level of existence and the last circuit is the infra-physical levels of existence. It is the sacred meaning of three concentric circles. According Indian temple architecture (Kiriya Patham), the temple construction is compared with the human (Adam Kadam / Purusa) body. The human body is covered with five sheaths such as Food sheath, Breath sheath, Mind sheath, Intelligence sheath and Bliss sheath. These five sheaths are represented as courts (circles) in the temple. It is the sacred meaning of five concentric circles. Also in the temple there can be one or three or five courts; among those, three are very common. The Muhammadan Seventh Heaven is said to be "beyond the power of description." ...In the Islamic graded concept of Heaven, which also prevailed among the Jews, one goes after death to the Heaven he has earned on earth, and the Seventh Heaven, ruled by Abraham, is the ultimate one, a region of pure light lying above the other six, the Heaven of Heavens. Anyone in the Seventh Heaven is thus in a state of ineffable bliss, having the greatest pleasure possible. Encyclopedia of Word and Phrase Origins (Hendrickson, 1987). In the Indian Hindu religion as one step ahead, we find seven upper worlds and seven lower worlds. Twice the seven are the births needed for the ultimate goal of reaching this Heaven. It is the sacred meaning of seven concentric circles. "The circle represents the principle, which has no beginning, no end, perfectly symmetrical and at all points equidistant from the center. It indicates the realm of radiations from the one center, at times an enclosure, a periphery, a circumscribed field of action." "This indicates that if we were to travel to the dark outskirts of the universe, we would run into a shell of Earth that encircles the universe. The thickness of the shell would be ten times thicker than the universe is wide. After that would be a layer of Water ten times thicker than the layer of earth. Then there are layers of fire, air, ether, mind, intelligence and false ego. Of course, the form of the elements in these layers is more subtle than what we normally find on this planet. The interior of the universe is very small in comparison to the layers of elements that encircle it. Obviously, therefore, no one can ever get out of this universe by means of any mechanical or material perfection. (Earth, Water, fire, air, ether, mind, intelligence and false ego - Eight). "The earth planet, situated in the middle planetary system, is called Bharatavarsa or Jambudvipa. The Srimad-Bhagavatam (5.20.3-42) describes six other major islands above Jambudvipa. These are Plaksadvipa and then Salmalidvipa. Above that is Kusadvipa or the moon planet. Beyond Kusadvipa is Krauncadvipa which has the width of 1,280,000 miles. The island of Sakadvipa, the planet of the pious, is next, whose inhabitants practice pranayama and mystic yoga, and in a trance worship the supreme Lord in the form of Vayu. "The next planet is Puskaradvipa or Brahmaloka, which is 51,200,000 miles in diameter and is surrounded by an ocean of very tasty water. On this planet is a great lotus flower with 100,000,000 pure golden petals, as effulgent as the flames' fire. The lotus is considered the sitting place of Lord Brahma, who is the most powerful living being in the universe and who is therefore sometimes called Bhagavan. The inhabitants of this planet worship the supreme as represented by Lord Brahma. In the middle of that island is a great mountain named Manasottara, which forms the boundary between the inner side and outer side of the island. Its breadth and height are 80,000 miles." What is the relation of 10, 8, and 512 in ancient system measurements, doubling the area of the square, the creation of the universe and Ezekiels temple? Let us assume the 10 multiplied by 10 for 8 times: 10 x 10 x 10 x 10 x 10 x 10 x 10 x10 = 100,000,000. Are these 100,000,000 the pure golden petals, which is the sitting place of Lord Brahma? Is the secret of the ten stages (Ten) from 1 to 32 indirectly shown in the size of the Holy of Holies in Ezekiels temple? Will the fact that the structure of a universe is ten times thicker than the one before be helpful to those who are researching the theory of 10 Dimensions? 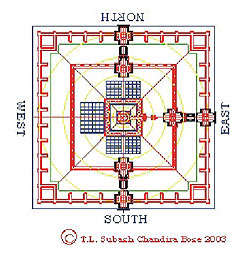 What is the link between size of Ezekiels temple (512 x512) in a square shape and the circle drawn inside the square with a diameter of 512 long cubits and the dimensions of 51,200,000 miles in diameter of Brahmaloka? Added to the above. Why is the open space at the center of Ezekiels temple, including the most holy of holy chambers, 80 long cubits x 80 long cubits? Is it connected to the statement "In the middle of that island is a great mountain named Manasottara, which forms the boundary between the inner side and outer side of the island. Its breadth and height are 80,000 miles?" "10. FATHER-MOTHER SPIN A WEB WHOSE UPPER END IS FASTENED TO SPIRIT (Purusha), THE LIGHT OF THE ONE DARKNESS, AND THE LOWER ONE TO MATTER (Prakriti), ITS (the spirits) SHADOWY END; AND THIS WEB IS THE UNIVERSE SPUN OUT OF SUBSTANCES MADE IN ONE, WHICH IS SWABHAVAT (a)." so is the Universe derived from the undecaying one" (I.1.7). Brahma, as "the germ of unknown Darkness," is the material from which all evolves and develops "as the web from the spider, as foam from the water," etc. This is only graphic and true if Brahma the "Creator" is, as a term, derived from the root brih, to increase or expand. Brahma "expands" and becomes the universe woven out of his own substance. And weave for God the garment thou see’st Him by"
Modern science is the newborn baby to Mother Nature, and what todays science tries to discover is only the past, not the present or the future. But our ancestors who lived all around this material world already discovered the secrets of past, present and future with their power of spiritual knowledge. They left this sacred information in the symbolic representation of concentric circles, one above the other, for the future generations. We observe a stone dropped in water pond naturally forms concentric circles, the surface of water in a glass when kept near a vibrating machine forms concentric circles, and surprisingly terrestrial waves are in concentric circles. All the above reveals the secret of the sacred meaning that "We are all from The One and shall return to That One. That One is The Supreme Soul. Our Athmas (Souls) are the part of Paramatha (The Supreme Soul); as the waterdrops shine on sunlight, we shall know our self (to shine) once we realize our inner self. The gradual increase and decrease in the dimensions of concentric circles indicate the concept of "evolve and dissolve" (originating from the One and returning to The One). This is indicated in geometrical pattern as concentric circles, one above the other. It is the symbolic representation of cosmic creation and a most sacred one. 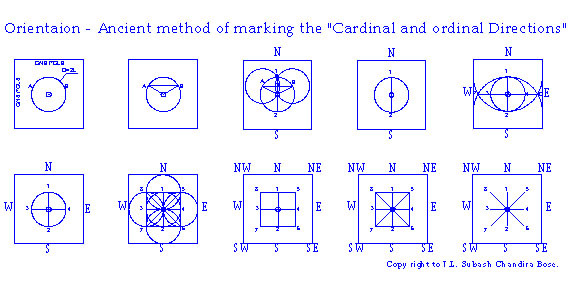 These geometrical patterns originated from the ancient ritual practice of marking the cardinal and ordinal directions and doubling the area of squares/circles/oblongs. Exemplifed by a Harrapa clay seal of 4000 years ago, that knowledge of ancient geometry was known all over the world. In this article we have only collected the various flowers (ancient data) from East to West, tied them in a string and decorated them beautifully to garland the memorials or monuments of those who spent their lives for the world peace. "May their souls rest in peace." "The concentric circles found all over the world are an eye opening to the realization that the people of our earth are interconnected and we are all of one human family. It is our hope that these discoveries of ancient symbols will continue to bring us all together in peace and we will see the wonderful connectedness of us all along with the cultural diversity that makes us all unique. We will continue to search out and bring public, as yet undiscovered sites that will contribute to this goal." "Living in this earth is a surprise and dying in this earth is certain."